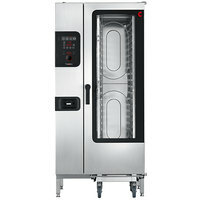 If you’re looking for a versatile piece of cooking equipment for your kitchen, then electric commercial combi ovens and gas commercial combi ovens are the perfect solution for you. These innovative ovens combine three cooking methods in one unit, allowing you to choose between pressureless steam, convected heat, and a combination of both. 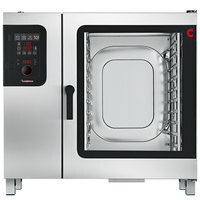 Best of all, since a commercial combi oven can replace your existing steam and convection oven, it will have a smaller footprint and save storage space. 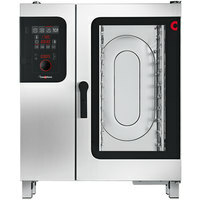 Our selection includes electric and gas combi oven styles, and each has its own special features. The best option for your establishment depends on your budget and utility availability. 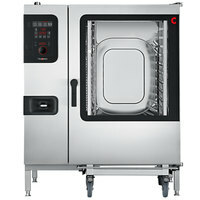 Gas commercial combi ovens feature open burners that directly transfer energy and increase temperature instantly, whereas electric commercial combi ovens are ideal when elevation is high. Additionally, we carry countertop combi ovens and full-sized units, so you can be sure to find the best combi oven for your needs.